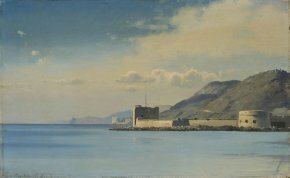 17/4/12 - Exhibition - Paris, Galerie Jean-François Heim - The Galerie Jean-François Heim is presenting an exhibition of painters from the Danish Golden Age, often featured over the last few years (see article in French) there and which runs until 11 May. This offering is in perfect symmetry with the exhibition currently on show at the Dutch Institute in Paris where the visit ends with a series of 19th century paintings of the same school. The Fondation Custodia rounds out its holdings on a regular basis with acquisitions and has in fact recently purchased a drawing by Wilhelm Bendz from Jean-François Heim, Young Man Lying Down (around 1830), as well as an oil on paper by Neumann, a very understated work in blue shadings (ill. 1) ; both will be on view at the gallery until May. About fifty works have been assembled here, also visible at the gallery’s stand in Maastricht (see article in French) not long ago ; they come, for the most part, from the same collection. Famous names appear, such as Eckersberg, "the father of Danish painting", but also Rorbye, Lundbye and Hansen... 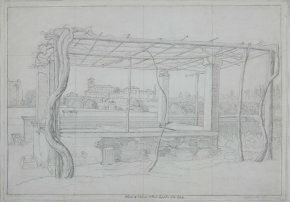 The first was fascinated by seascapes, evoked here with Danish Brick, while a very beautiful drawing recalls his stay in Rome between 1813 and 1816. Preparatory for a painting held at the Davids Samling Museum in Copenhaguen, its rigorous composition reminds us that he studied under David, and makes the work particularly attractive (ill. 2). A certain number of these painters also traveled through Italy, such as Rorbye, Lunde and Petersen, treating light with a Northern touch. Other Danish landscapes will be sure to draw visitors : the château of Frederiksbourg seen by Kieldrup or the fantastic cliffs at Mön described by Adolf Carl, known for his views of Sicily as well. 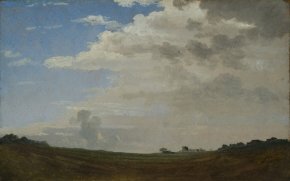 A small study by Vilhelm Kyhn communicates the poetry of empty horizons or the meeting between the sky and the invisible sea, marked by a long green line, while the brush enables the painter to sweep away the clouds making room for the rain (ill. 3). Some artists are obsessed with detail like Kiaerskou who offers us a minutely illustrated view of the Eider canal conveying a steamer. 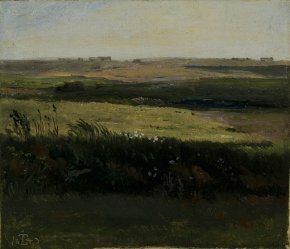 More concerned with the overview of his scene, Lundbye produced a small painting which is stunningly modern (ill. 4) showing us an open landscape, made up of strips of shadow and light with, in the background, bright colors and blocks which would have attracted the Nabis, or even Gauguin who also lived in Denmark. Visitor information : L’Age d’Or de la Peinture Danoise, from 6 April to 11 May 2012, at the Galerie Jean-François Heim, 134 rue Faubourg Saint-Honoré, 75008 Paris. Tel : +33 1 53 75 06 46. Open from Monday to Friday, 10 a.m. to 1 p.m. and 2 p.m. to 6 p.m. A catalogue has also been published for the occasion.